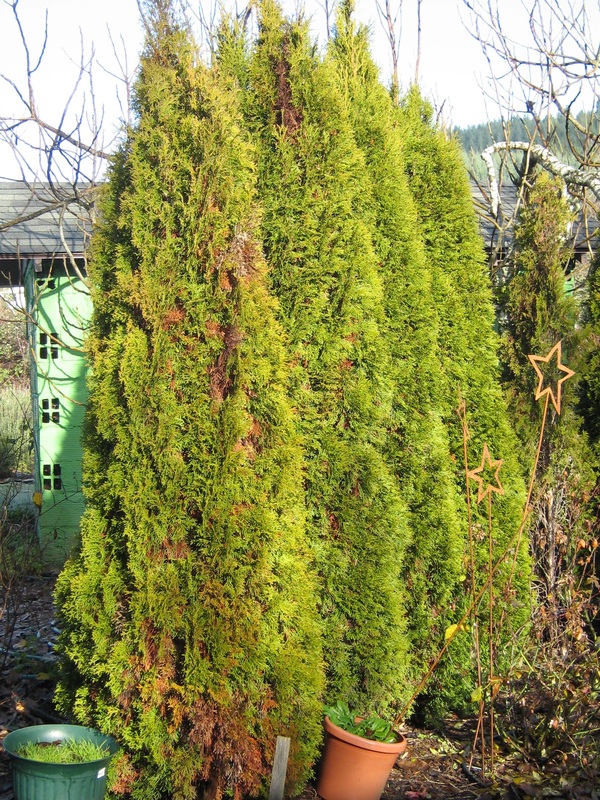 Note the general dieback of this arborvitae foliage which was later found to be due to water stress. Note the general reddening of the leaves of this maple. Sweetgum (Liquidambar sp.) has wonderful red fall foliage but something is wrong when it shows up in late August. 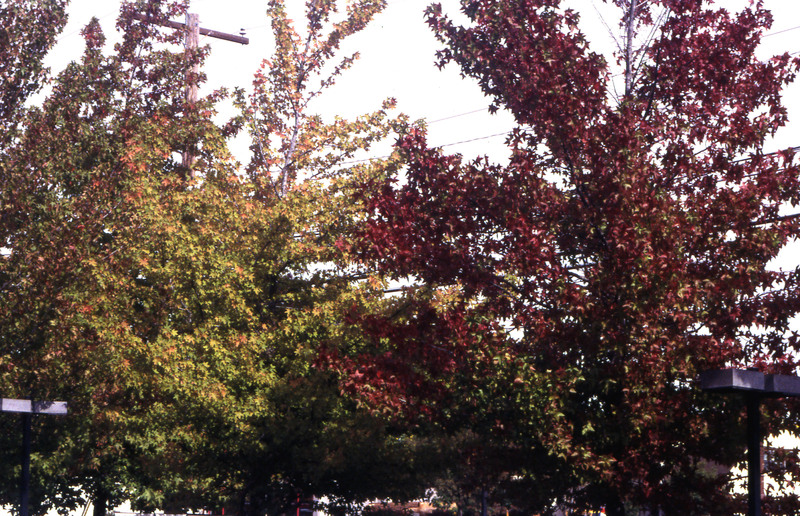 These trees show symptoms of tree decline. Landscape tree samples often come into the OSU Plant Clinic with the complaint of a thinning canopy and premature leaf drop. Usually, samples do not have visible foliar or twig disease but do exhibit several symptoms of a nonspecific ailment called decline. Decline refers to progressive loss of tree vigor and health. Trees in decline have an unthrifty look to them. Often, leaves are fewer than normal, and overall growth has been poor. Internode length (the space between each year’s twig bud scars) decreases from several inches to less than 0.5 inch. Leaves may have yellow or brown (necrotic) margins, and tips or may be smaller than normal. There may be premature autumn coloration and early leaf drop. Twigs at the ends of branches may die back, and often limbs at the top of the tree will be drying and bare of leaves. Dead branches can occur next to apparently healthy branches. Tree decline never happens overnight. Decline can be the result of a single disease or environmental event or, more common, from stress over many years. Often there is more than one stress factor. Stressed trees often are predisposed to other problems, such as those caused by insect borers, opportunistic organisms, and injury from extreme climatic factors. Any of the following may contribute to tree decline. Established Plants Insufficient water over several years is the most common cause of tree decline. Trees need supplemental irrigation in the dry summer season even if the spring has been wet. Irrigation is particularly important for trees transplanted in the past 3 years or that are stressed from any of the factors listed above. Water deeply and infrequently (once a week) rather than sprinkling lightly for 5 or 10 minutes a day. When the soil 4 inches below the surface feels dry or only slightly damp, it is time to water. Well-drained, sandy soils need more water volume, which should be applied more frequently than for a loam or clay soil. Trees, especially conifers, in drier regions often need water during the winter to prevent desiccation. Identify sources of stress and eliminate them if possible. Mulch under the tree to keep down weeds and to prevent the need for mowing right up to the trunk. Organic mulches such as leaf litter and wood and bark chips work well. Do not use plastic because it interferes with root–soil gas exchange and water infiltration. Spread the mulch 3 to 6 inches deep in a circle at least 3 feet in radius from the trunk. Keep the mulch from direct contact with the tree trunk. Protect trees from bark-chewing animals by placing hardware cloth or other wire mesh around the trunk. In high-traffic areas or public landscapes, try to reroute foot or vehicular traffic to prevent compacting soil in the root zone. Correctly prune out dead and dying branches to prevent insect and disease invasion. 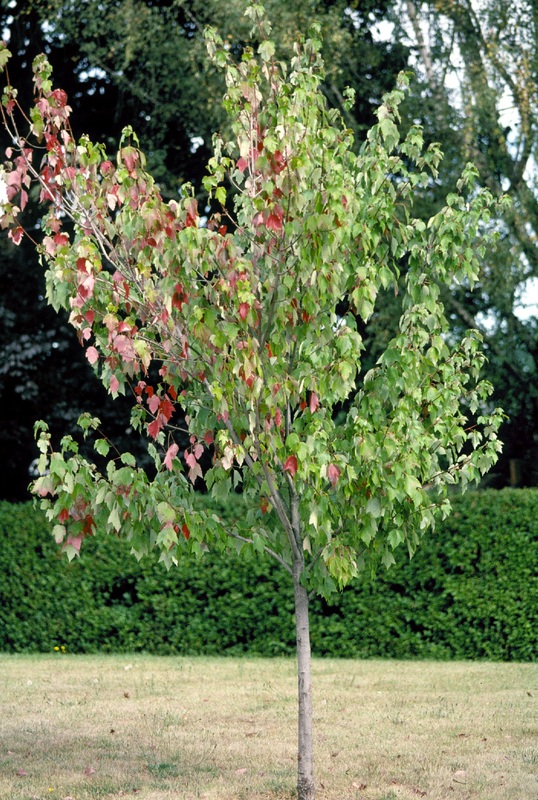 Fertilize trees with symptoms of nutrient deficiency (yellowish or off-color leaves). Trees to be Planted Prevention is the best control method. Select trees that are adapted to your cold hardiness zone (the nursery where you buy the plant should be able to help you with this). Place your new tree in an area where it can get the sun or shade it prefers. Transplant properly and make sure to water adequately; newly transplanted trees can take up to 3 or more years to become well established in the landscape. Mulch around the tree and water as described above. Proper care in establishment can help to prevent tree decline and promote tree health. Clark, J.R. and Kjelgren, R. 1990. Water as a limiting factor in the development of urban trees. Journal of Arboriculture 16:203-208. Tattar, T.A. 1989. Diseases of Shade Trees, rev. ed. New York: Academic Press.